Canning is a popular way to preserve food, especially when you have grown an abundance of vegetables or would like to enjoy certain foods later on in the year. When you can cherry tomatoes, you process and seal them in an air-tight container to prevent bacterial growth. 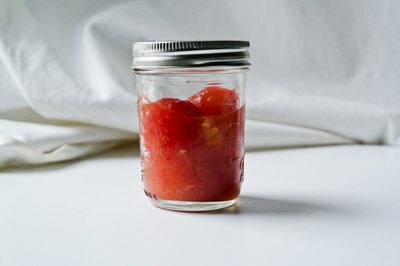 Because tomatoes are so acidic, the USDA’s National Center for Home Food Preservation recommends adding lemon juice or citric acid to each jar of cherry tomatoes to develop the correct pH to help reduce the risk of botulism. Boil water. 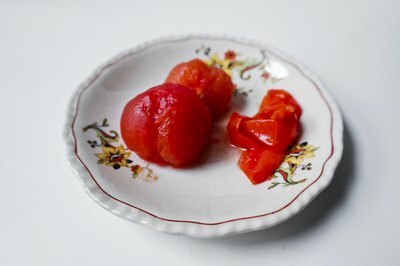 Dip the cherry tomatoes in the boiling water for up to 60 seconds, or until the skins split. Then, immediately place the tomatoes in cold water. Remove the skins from the cherry tomatoes. Add one quarter tsp. of citric acid or one tbsp. of bottled lemon juice to each jar. Add one tsp. 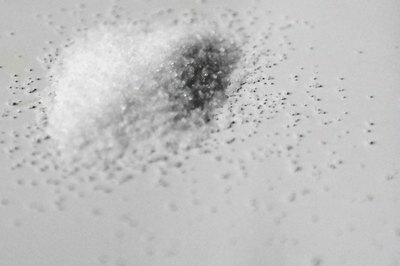 of salt to each jar. Fill the jars with the peeled cherry tomatoes. Leave a one-half-inch gap between the tomatoes and the top of the jar. 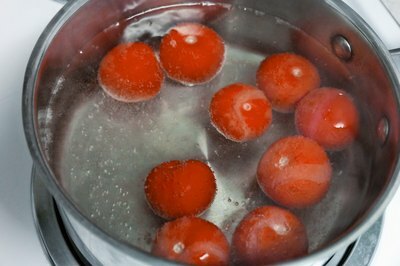 Place boiling water over the cherry tomatoes. 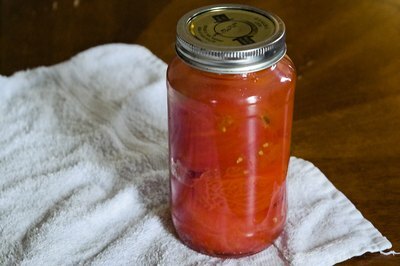 Leave a one-half-inch gap between the tomatoes and the top of the jar. Place the lids on the jars. 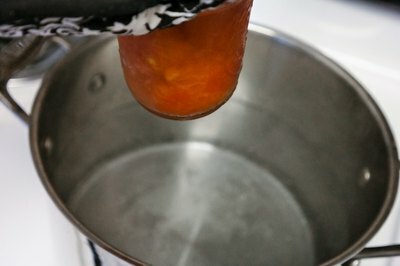 Place the jars in the canning rack and into a large stockpot or boiling water canner. Pour water into the pot until the water is two inches above the jars. Remove the jars and let the water come to a boil over high heat. 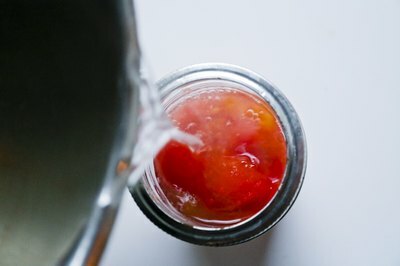 Carefully lower the jars of cherry tomatoes into water when the water reaches 140-degrees. Cover the pot and allow the cherry tomatoes to boil for at least 40 minutes. 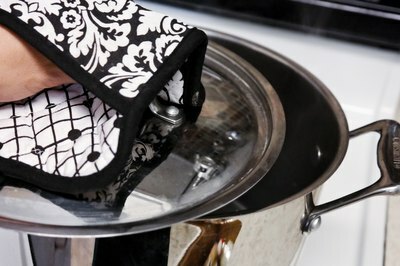 After the jars are done boiling, turn off the heat on the stove and remove the lid from the pot. Let the jars of cherry tomatoes sit in the pot for an additional five minutes. Carefully remove the jars from the pot. Place them on a towel, an inch apart, and allow them to cool for at least 12 hours at room temperature. Make sure the jars have at least two inches of water over them while they are boiling. Add additional boiling water to the pot if needed. If you live at an altitude of sea level to 1,000 feet, boil the jars of cherry tomatoes for 40 minutes. If you live at an altitude of 1,001 to 3,000 feet, boil the jars of cherry tomatoes for 45 minutes. If you live at an altitude of 3,001 to 6,000 feet, boil the jars of cherry tomatoes for 50 minutes. If you live at an altitude above 6,000 feet, boil the jars of cherry tomatoes for 55 minutes.